A few months ago I worked on a legacy Typescript project where having Class files with more than 1,500 lines-of-code was quite common. A single source-file with this many lines-of-code is sometimes known as a "God Class" because it is capable of doing too many different things. Every time I encountered one of these files, I found myself wishing there was a way to quickly get a high-level understanding of the public API of the Class, as well as a rough understanding of its internal implementation. I hoped that this would help me make changes with confidence, and maybe even do a bit of refactoring to extract some parts of the code to a different well-defined module. The rows represent the public API of the Class\Module. These would be the public methods of a Class or the exported functions of a Module. 🔐 Private methods of a Class or non-exported functions of a Module. 📦 Dependencies on other Classes\Modules. Class Constructor parameters are assumed to be dependencies injected by an IoC mechanism (Angular 1.x style). Imported modules are considered dependencies for Modules. 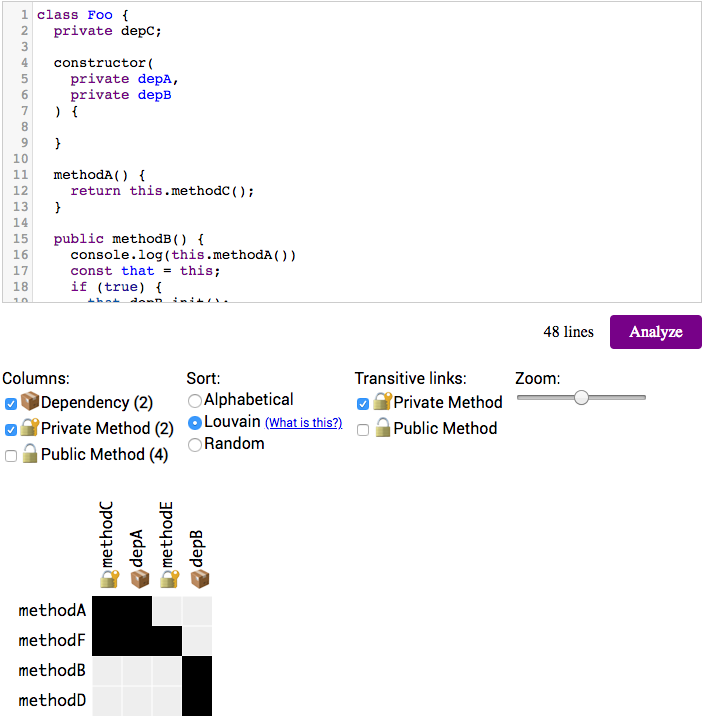 So in the example above we can see that the public API of this Class is composed of four public methods: methodA, methodF, methodB, and methodD. The "internal implementation" consists of private methods methodC and methodE and a dependency on external Classes depA and depB. Notice that in order to provide an accurate representation of the structure of real-world complex code, "AST Scout" follows private methods as transitive links. For example, even though depA is not used directly in the source of methodA, it is marked as used by it because methodA uses methodC and methodC does use depA. 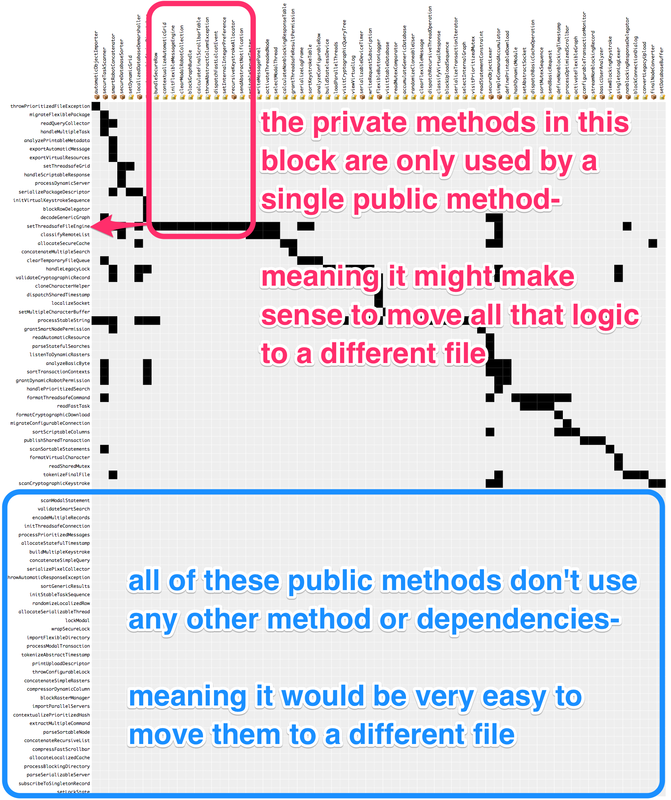 If there are many black squares in the same column for many different rows it means that all those public methods rely on that same private method\dependency, which is indicative of high cohesion. Contrarily, if there is a column that contains only one black square for a single row, then that private method\dependency is only used by that public method. More so, if a row contains no black squares, then that public method doesn't depend on any private method\dependency. Cases like these could be indicative of low cohesion, and might represent a good refactoring opportunity. In terms of analyzing the source code, I was pleasantly surprised to learn that the Typescript compiler API can run directly in the browser. In fact, if you implement a custom Typescript Language Service (as done here), then it can even perform "Find References" on a Symbol. This ability is crucial because "AST Scout" must be able to track references to figure out what uses each private method\dependency. Overall, this allowed me to write "AST Scout" as a completely static site with no need for a server. In terms of the visualization, I've tried a few different options before settling on using an Adjacency Matrix, but to my surprise my generated matrix looked nothing like the polished examples I was inspired by. I then realized that the key to generating a meaningful matrix is to set the order the rows and columns in a meaningful way. 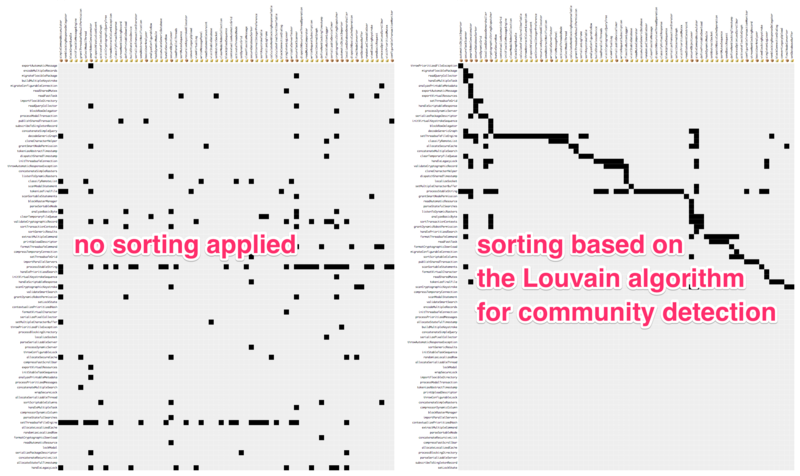 After some much needed guidance, I learned of an algorithm "for community detection" called the "Louvain Method" that can be applied to perform this sort. My underlying assumption before starting this project was that if you look within a single source file and apply the right analysis, you'll gain insights into how to split it up. Once the tool was built I was able to test this by trying it on a few "God Classes" from the aforementioned codebase. In some cases it gave hints on how to refactor the code, but in some it just solidified the fact that the code is a mess without leading the way out of it. Ultimately I think this approach of looking internally in the file for clues has its limits. The Interface Segregation Principle (ISP) might suggest a different external-based approach which could yield better results. According to the ISP, one "smell" that hints at how to split up an interface is if some consumers of that interface use a completely different set of its methods than its other consumers. Similarly, "AST Scout" could scan your entire codebase to see how a particular Class is used, and would analyze\visualize that to help you identify split-points. Hopefully you find this concept interesting and would like to try to use this tool to visualize some parts of your codebase. There's a live demo here, and the code is available here. I'd love to get feedback or discuss this idea, so feel free to reach out to me via twitter.